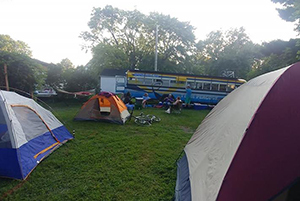 Upper Iowa University’s Team Peacock will celebrate its 15th year participating in RAGBRAI (The Register’s Annual Great Bicycle Ride Across Iowa) this summer and the team is seeking camping accommodations. RAGBRAI is not just a vacation for the UIU riders. Comprised last year of alumni, faculty, staff, students, and even UIU President Bill Duffy, Team Peacock raised over $38,000 to support Upper Iowa projects, programs and scholarships. Persons interested in hosting Team Peacock, or know of someone who would be a perfect host, are asked to contact Team Peacock committee member Brenda Luzum at luzumb@uiu.edu or 563-425-5238. For more information about Team Peacock, visit uiu.edu/teampeacock.